If you’ve never heard of OC ReMix before, it’s basically a site that hosts remixed video game songs by various different artists. Everything is free and there are some pretty good songs. Anyway, Capcom U.S.A.’s Rey Jimenez decided to get them to do the soundtrack (the first professional game soundtrack OC ReMix has done). I think it’s really awesome they decided to let the fan’s make a soundtrack, I really feel like they put a lot into it and it shows. If you’re interested in picking up the soundtrack, you can grab it here. 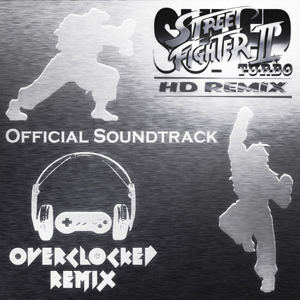 Since they are just remixes, many of the songs sound vaguely similar (some more so than others), so you still get that nostalgic feeling remembering playing Super Street Fighter II on the SNES, while at the same time getting something completely new. I think it fits perfectly with the “Remix” idea of the game. I particularly like Akuma’s stage, T. Hawk’s stage and Cammy’s stage. I’m really liking this free soundtrack thing, Castle Crashers, Super Street Fighter II Turbo HD, I’m sure it keeps costs down for the developers, but I also think the individuals making the songs are doing excellent jobs as well.